The sporty print men's Splash swimming shorts are a great choice for fitness and leisure swimming. 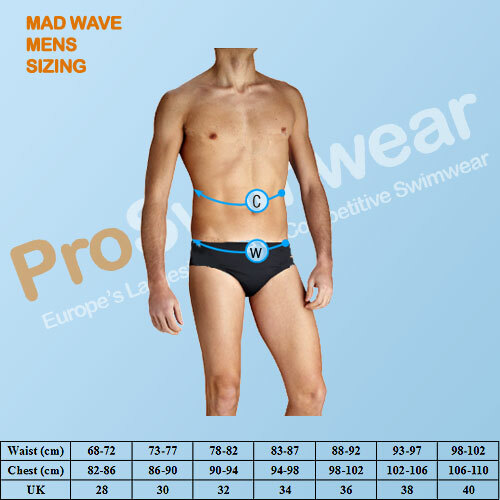 These Splash swimshorts are made with Mad Wave's Base fabric which contains Italian Lycra which gives maximum comfort to swimmers. The materials 4-way stretch properties ensure that these swimshorts retain their shape, so that they feel like new everytime you put them on. Don't forget to follow the care instructions and rinse your Mad Wave swimshorts in fresh cold water to get the maximum amount of swims out of your swimsuit! The comfortable fitting Base fabric feels like a second skin.